1. 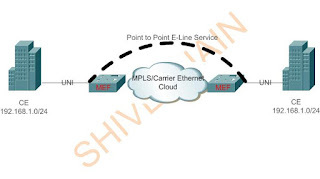 Ethernet Private Line aka EPL:- Ethernet Private Line is the replacement of legacy dedicated TDM private line for point to point connections consequences save cap-ex as well as op-ex. It is dedicated port and ethernet Virtual connection per UNI. 2. 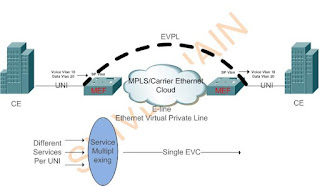 Ethernet Virtual Private Line aka EVPL:- Ethernet Virtual Private Line is the replacement of legacy frame relay and atm circuits. Multiple services can be multiplexed in single UNI. Ethernet is picking up its boom not for the speed but the ability to transport various technologies. Ethernet is one of the disruptive innovations of the era. Earlier Ethernet is used only to connect home based computer to access the internetwork; but now a days it is used as WAN solution. The advantage of using it as WAN not only to provide the speed in single port but to save lot of money in terms of provisioning and infrastructure. Ethernet is now evolving from LAN Ethernet to Metro Ethernet. Every business user would like to adopt the Ethernet as last mile/first mile because of its low cost and high advantages. So from Business User perspective what actually he demands from SP to get that link which is MEF certified. c) Reliability:- In case of failure of links, minimum time to converge.